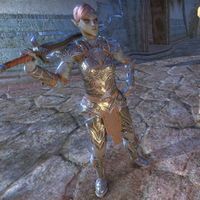 Reron Drom is a Dunmer soldier who can be found in the Canton of St. Olms the Just in Vivec City. "This city will be the pride of all of Vvardenfell one day, mark my words. And we, my friend, get to watch it grow, one stone at a time. It makes me all atingle!" "I love this city! I love the cantons. I love the waterfalls and ocean view. I even love the rock that hangs in the sky above! Did I happen to mention I love this city?" "I wonder what all the excitement was about? Was Lord Vivec testing us? Maybe it was a lesson of some sort? I expect we'll hear all about it at the next sermon." "Baar Dau is much closer now that that harrowing experience has come to an end. I think I like it better this way. You can practically see every crack and crevice now." "I love this city. Almost losing it makes me appreciate what we have so much more. I think I'll use my sword to protect Vivec and its people. It's the right thing to do." This page was last modified on 11 February 2019, at 00:49.